My name is Michael Jack. I am a former Ontario Provincial Police officer. I am an Israeli-Canadian of Russian Jewish heritage. The correct spelling of my given name (in Latin letters) is Mikhail. However, it has never been used in any documents. I have always used Michael. My former surname in Russian, before it was “changed” to Jack, is (in Cyrillic) Жак (properly pronounced: Jacques). I was born on December 16, 1972, in St. Petersburg (formerly Leningrad) in Russia. I lived in St. Petersburg for 17 years until February 1990, when our family (my mother, my father and I) immigrated to Israel. From February 1990, until September 2000, I lived predominantly in Israel, where I attended a marine technological school and marine college and served in the Israeli Navy from May 1993, until April 1996. From May 1996, until July 1997, I worked in the Israeli Merchant fleet – I lived and worked on a number of different merchant ships wherever they sailed. From July 1997, until September 2000, I worked for Intel Electronics Ltd. From September 1997, until September 1998, I lived and worked in the USA as part of my job related training. From September 1998, until September 2000, I lived and worked in Israel. In September 2000, I immigrated to Canada. I lived in Peterborough, Ontario from September 30, 2000, until December 2010. From January 2001, until August 2006, I studied and worked at Trent University in Peterborough, during which time I earned two degrees – Bachelor of Science in Computer Science and Master of Science in the Applications of Modeling in the Natural & Social Sciences. I graduated from Trent University with a 91.4 cumulative average and during my schooling I was the recipient of multiple awards and prestigious scholarships for my academic achievements, teaching assistance, interpersonal and leadership abilities, and research accomplishments. From January 2007, until July 2008, I worked as a course instructor (adjunct faculty professor) in the Computer Science department at Trent University. In August 2007 I met the Chief of York Regional Police, Armand La Barge, in the Trent University’s weight lifting room. At the time, I was teaching Computer Science courses on a contract basis and was looking for a permanent job where I could maximize my skills and cash in upon the knowledge and skills acquired over the 35 years of my life. At the time, the Chief was completing his Master’s degree in Canadian and Native Studies at Trent University. During a few workouts together we talked a fair amount and among other things discussed our traveling and academic experiences, books we read in common, spirituality, religion, physical fitness and firearms. In one of the conversations towards the end of August the Chief said that I had some great qualifications. He further suggested that modern police services were looking for people with multilingual and computer skills and that I was a good candidate for becoming a police officer. I did not know much about policing at the time, but the Chief presented himself to me as an erudite and wise man and literally inspired me and gave me the encouragement to re-evaluate the direction of my life. I decided then and there that I would pursue a career in policing. In March 2008 I obtained my O.A.C.P. Certificate of Results (a mandatory set of tests required to be passed by an applicant to qualify for applying with any police service in the province of Ontario) through the Ontario Provincial Police (OPP) and applied to the York Regional Police and the Ontario Provincial Police. A couple of weeks later I also applied to the Halton Regional Police. The OPP was the first one to get back to me and invite me for an interview. On May 29, 2008, I was interviewed by two recruiting sergeants (Sergeant Joanne Whitney and Sergeant Steve Haennel) at the OPP headquarters in Orillia. Some 20-30 minutes after the interview, when I was en route to Peterborough, I got a phone call on my cellular phone from Sergeant Haennel who told me they believed I was a good fit for their organization and they had a psychological assessment ready for me on the following day if I was interested, to which I immediately agreed. He also said that I could come in dressed casually. 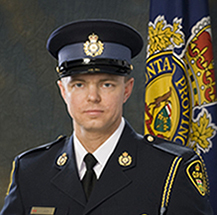 On May 30, 2008, I successfully passed my psychological assessment and informed Sergeant Haennel that I had been scheduled for an interview with the Halton Regional Police on June 6, 2009, and asked him for advice on my course of action. Sergeant Haennel said that while he could not tell me what to do, he said, 'We want you' and reassured me that they were going to put my application on a fast track. There was a feeling of trust in what he was saying to me so I cancelled my interview with the Halton Regional Police service and informed Sergeant Haennel about it via email the following day. Sergeant Haennel was true to his word and my was fast-tracked. It was conducted by Constable Alice Jolicoeur (badge 7454). On or about July 25, 2008, I signed an offer of employment from the OPP and was advised of my posting at the Peterborough County OPP Detachment. On or about July 27, 2008, I got a call from a York Regional Police recruiter inviting me for an interview, which I turned down due to the fact that I had already been hired by the OPP. For almost eight years that I studied and worked at Trent University, which is a multicultural environment comprised of students and faculty from all over the world, there has not been a single incident where I felt I was discriminated against or harassed based upon my strong Russian accent, place of origin, ethnic origin, racial status, creed, or the fact that I was not originally from the Peterborough area. I was valued and appreciated for my work ethic, initially as a student and then as an instructor in the Computer Science department. During my time at Trent University it never dawned on me that outside of the University boundaries in the Peterborough area I would encounter a different environment. I did not know what I was getting myself into when I was posted at the Peterborough Detachment. Not only did I have no opportunities at the Peterborough Detachment to apply my multilingual, multicultural and computer skills (which were the very reasons I chose the occupation of a police officer based upon the suggestion of a Police Chief that my skills constituted great assets in modern policing), but in addition to numerous violations of Ontario Provincial Police Orders with respect to dealing with me I was also subjected to acts of harassment, racial and place of origin discrimination because I was well-educated, was not a local, was of a Russian Jewish heritage, was of Israeli citizenship and most notably spoke English with an extremely noticeable and thick Russian accent. From September 1, 2008, until November 27, 2008, I attended the Ontario Police College in Aylmer from which I graduated with a 91.6 cumulative average (course average was 81.5; number of recruits approximately 470). At the college I was the recipient of the 100% on the Ontario Police Fitness Award (only 5 recruits (1%) received the award). From November 30, 2008, until January 9, 2009, I was trained at the Provincial Police Academy. At the Academy I was the recipient of a “Top Dog” award for being the best in my class (108 recruits) in handgun use based on draw speed, shooting speed and accuracy. From January 12, 2009, I was posted at the Peterborough County OPP Detachment as a Probationary Constable (my badge number was 12690). From January 12, 2009, until August 20, 2009, I worked on Platoon ‘A’ shift. My shift supervisor was Sergeant Robert Flindall (badge 9740) and my coach officer was Constable Shaun Filman (badge 11212). From August 21, 2009, until December 15, 2009, I worked on Platoon ‘D’ shift. My shift supervisor was Sergeant Peter Butorac (badge 6901) and my second coach officer was Constable Richard Nie (badge 10517). Staff Sergeant Ron Campbell (badge 6385) was the Operations Manager from before I reported to the Peterborough Detachment until late November 2009. Inspector Mike Johnston (badge 6138) was the Detachment Commander from before I reported to the Peterborough Detachment until October 2009. Accused me of answer shopping and when I stopped asking questions for fear of reprisals accused me of not asking questions and when I started asking questions again accused me of asking questions I already knew answers to. There was a total aberration of policies (be it the Ontario Provincial Police Orders or Human Rights Code or the Ontario Public Service) when it came to dealing with me. On December 15, 2009, I was released from employment with the OPP based on my failure to meet the requirements of the position of a Probationary Constable based on my unsatisfactory work performance during my probationary, that is, discriminatory, harassing, bulling, humiliating, derogatory and oppressing period. I was not dismissed from employment with the OPP because of budget cuts or because there was a shortage of the positions. As a matter of fact, during my time at the Peterborough County OPP Detachment, the detachment was understaffed – we were short of 5 police officers! My dismissal from employment was orchestrated by a few officers from the Peterborough County OPP Detachment who were biased against me and targeted me with all they had. The majority of them were locals with a scope of view limited to their county only. They deliberately turned a blind eye to the potential I had and the benefits I could have brought to the OPP in the long run. What a shame! What a disservice to the very organization they are part of! When I was driven back from the City of Kawartha Lakes Detachment on December 13, 2009, by Sgt. Peter Butorac after having been served by Staff Sergeant Mike Reynolds with the Notice of Proposed Release from Employment, I was talking about how wrong everything that was done to me was at which time Sgt. Butorac told me that they could only do so, so long, until someone who has a lot of money sues the OPP. I did not understand the significance of his revelation to me at the time, but I certainly do understand it now. While I have very little money at my disposal, I have my strong will and dedication to this case, for I firmly believe that evil must be punished. Currently I have an application before the Human Rights Tribunal of Ontario (HRTO 2010-07633-I). The first set of 3 hearing days took place on May 22-24, 2012. The second set of hearing days took place on November 1-2 and 5-7, 2012. Furthermore, on March 15, 2013, my friend and representative filed a Statement of Claim (CV-13-476321) on my behalf with the Ontario Superior Court of Justice in Toronto. This claim is literally all I have to live for and coupled with my strong desire to expose the truth about the OPP and how its minority employees who speak with a thick accent are treated, I am extremely concerned of prematurely filling a withdrawal of my Application before the Tribunal in the event that my claim is barred from proceeding for whatever reason. The barring reason that is of primary concern to me is that of over-coming a perceived breach of the Limitations Act. For that reason we have put forth a motion before the Tribunal requesting that my proceedings before the presiding Vice Chair Mr. Keith Brennenstuhl be frozen on the grounds that this Statement Claim has been filed and that a motion for withdrawal will be forthcoming should the claim be allowed to proceed. Having analyzed the Respondent's disclosure (volumes upon volumes of information) the picture is clear. After the two ride-alongs in August 2008, with two Peterborough County OPP officers – Constable Marc Gravelle (badge 12091) and Constable John Pollock (badge 11714) – unbeknownst to me, I was labeled crazy Russian ('Crazy Ivan') who allegedly killed 'shot' many people during my time with the Israeli Army. Subsequent to that I was subjected to the so-called "follow-up" on my completed background investigation and an additional psychological assessment with the OPP's civilian psychologist Dr. Denis Lapalme on my first day at the Provincial Police Academy. While I had successfully passed both of the additional checks, as a result of the Defamation by Libel and Slander my work environment at the Peterborough County OPP was poisoned prior to me even reporting there for duty. Those acts of Defamation injured my reputation and lowered me in the estimation of some members of the Peterborough County OPP Detachment and in particular caused them to regard me with feelings of hatred, contempt, ridicule, fear, or dislike. In short, I sensed that I was not welcome by some members of the Peterborough County OPP Detachment on my very first working day there. Despite my first coach officer (Constable Shaun Filman) treating me like a leper I managed to stay afloat for a few months due to being proactive at studying the job on my own, receiving help from those who were willing to assist me and relatively light workload compared with the busy summer period. When the busy summer season began, instead of helping me, some officers, primarily Sergeant Robert Flindall and Constable Jennifer Payne (badge 9931), started deliberately targeting and ‘drowning’ me. Specifically, on one occasion on July 23, 2009, I was directed by Sergeant Robert Flindall to have an individual arrested and charged with Criminal Harassment (SP09164458) and to continue the detention of the individual by having him held for a ‘show cause’ hearing the next day before a Judge or Justice so as to get the individual released on certain conditions. This was contrary to everything that I was taught since there was legally no statutory authority to justify the continued detention of such an individual especially since I, as the Officer in Charge of the investigation, could impose the same conditions that a Judge or Justice would. I was left alone to work overtime on the case - a case that due to the tenderness of my service I had absolutely no experience dealing with. Upon the advice of Constable Jamie Brockley (the common-law spouse of Constable Jennifer Payne-Brockley at the time) I arrested and then released the prisoner the following day on a Promise to Appear and Undertaking before an Officer in Charge for Criminal Harassment. I released him with certain conditions. Sergeant Flindall, who was on vacation at the time was telephoned by Constable Jennifer Payne and advised that I had disobeyed his directions. Upon his return Sergeant Flindall reprimanded me sternly in the presence of my coach officer, Constable Shaun Filman and an Ontario Provincial Police Association representative stating to me among many other things, ‘I have never had such an incompetent recruit yet.’ Sergeant Flindall went on to tell me that my job was in jeopardy for mishandling the investigation and taking too long to complete it. He also denied the approval of the overtime I incurred while working on this case. It was my overtime work after the individual was arrested and released that revealed that there were no grounds to charge the individual. However, as per the orders of my supervisor I had to do so. Failure to have complied with his order would have certainly resulted in giving him grounds to charge me with Disobeying an Order under the Police Services Act. Basically, I arrested and charged an individual without due investigation simply because his brother-in-law coerced his wife to use police to take the individual off their back for owing him large sums of money. Had I only been given more time to properly investigate the matter, I would have never charged that individual with anything. He should have either been spoken to or in the worst case scenario had a Peace Bond imposed on him through the courts. As a result of the overall treatment thus far, which I could continue writing about on and on, I contacted the Ontario Provincial Police Association on August 4, 2009, and conveyed my concerns to them. However, it was not long after doing so that I started experiencing severe reprisals. Sergeant Robert Flindall and Constable Jennifer Payne literally launched an annihilation campaign against me in an open manner and in dire violations of the Ontario Provincial Police orders. The overall treatment that I endured was also criminally wrong. The 'Crazy Ivan' nick name that was given to me was slanderously defamatory. Moreover, an e-mail from Sergeant Brad Rathbun of the Peterborough Detachment in August 2008 (months before I even commenced my employment at the Detachment) wherein he inferred that the OPP ought to have had some concerns about granting employment to an individual that is bragging about the many people he has killed (shot) during his service time with the Israeli Army was libelously defamatory. First of all, it was filled with lies and secondly, I served with the Israeli Navy and not the Army. More so, during my three year term I never experienced any form of combat duty so how could I have killed anybody or even shot anyone? Another act of criminal negligence by the OPP was their accusation of me associating with Undesirables. I was investigated by their Professional Standards Bureau based on an internal complaint initiated by Sergeant Robert Flindall because in February 2009 I showed to Constable Shaun Filman and Detective Constable Jamie Brockley a six year old photograph that showed me standing with five other individuals at a fitness facility in Peterborough. Detective Constable Jamie Brockley advised me that two of the individuals in the photo, whom I have never associated with and never had even any contact since the August of 2003, had criminal involvement and were linked to Albanian organized crime. I expressed interested in taking part in an undercover operation since those individuals did not know I was a police officer and since I have always detested and strongly opposed to illicit drugs. However, seven months later, which was 'coincidentally' shortly after I contacted the Ontario Provincial Police Association seeking help from the ongoing and continuous harassment, members of the Peterborough Detachment filed an Internal Complaint against me alleging that I was associating with Undesirables. Hence, the allegation specifically referred to Canadian citizens of Albanian origin who had criminal records as Undesirables. No Canadian citizen deserves to be labeled as such. Especially in this day and age where one frequently hears about police charges being erroneously laid that in turn ruins lives. These acts of the OPP were contrary to sections 300, 301 and 319 of the Criminal Code of Canada. When in mid-August 2009 Acting Superintendent Doug Borton attempted to rescue me by moving me away from Sergeant Robert Flindall's and his minions’ direct targeting, Sergeant Robert Flindall discredited and maligned me (i.e. falsely charged me under the Highway Traffic Act, fabricated a number of my performance evaluation reports and fraudulently alleged that I refused to sign two of them, fabricated Professional Standards Bureau investigation against me alleging that I was associating with an Albanian organized crime group, further poisoned my work environment by spreading negative rumors about me). Then I was thrown into his next-door neighbor and subordinate officer's hands (Constable Richard Nie) to finish me off. Beginning September 2009, I was assigned to a new patrol zone – Zone 2 (I worked in Zone 3 for the first 8 months and mind you, it takes many months to adequately learn zone geography). I was forbidden to work on my own. I was forbidden to work paid duties. I was forbidden to work over time. From the first hour on the new platoon Constable Richard Nie started constantly finding "faults" with me and meticulously documenting them in his notebook and in my monthly performance evaluation reports. On later reflection I realized why he was doing this. The targeting did not stop and the neighborly relationship, which I only learned about many months after my termination, between Constable Richard Nie and Sergeant Robert Flindall meant that the plan to terminate my employment was being carried on. Constable Richard Nie was particularly skilled in terminating minority probationary officers. He demonstrated this quite effectively during his "coaching" of Probationary Constable Harry Allen Chase and was able to justify his forced termination. Not only did he carry out the plan to a tee, but he also drilled into my mind (through constantly picking on me, belittling me, humiliating and oppressing me) that I was a total failure. It took only two weeks, from the beginning of our work together on September 9, 2009, for Constable Nie’s sadistic "coaching" methods to oppress me to such a degree that I no longer offered explanations for my rationale for doing things and accepted his psychological harassment, mental and emotional tormenting of me quietly and in a docile manner. His was my master. I was his slave. At one point, on October 17, 2009, to be precise, I broke down and cried in the cruiser while he just sat next to me and smiled. There was absolutely no compassion or empathy from him. What kind of person one has to be to smile when another human being is crying? This, according to Psychiatrist Marie-France Hirigoyen, is the intent of many abusers: to systematically "destabilize" and confuse their victims (with irrational, threatening behavior that preys on the victim's fears and self-doubts), to isolate and control them and ultimately to destroy their identity. Such acts are often difficult to reverse or rectify, and the process is likened to a literal assassination of human life. It is the Cold Blooded Destruction of Our Most Valuable Personal Asset - Character. The damage sustained lasts a lifetime. On the contrary I, an educated individual (a former University instructor), was brought down to my knees and executed by the local Old Boys Club (mafia). Any tightly knit group of trusted associates. A closed group of people in a particular field, having a controlling influence. Any small powerful or influential group in an organization or field; clique. Some of the Peterborough County OPP officers were prejudiced against me due to my race, ethnicity, ancestry, religion, place of origin and citizenship rather than reasonable grounds. They formulated opinions about me which were not based on my merits, but rather on my membership in a group with the same characteristics. This is the essence of discrimination. I was singled out for greater scrutiny and differential treatment. I was entirely on my own in Canada, with my landlord being the closest person to me. At Peterborough Detachment, on the other hand, nepotism was thriving. My key personal respondents: Sergeant Robert Flindall, Constable Jennifer Payne-Brockley, Constable Shaun Filman, and Constable Richard Nie were all local to Peterborough area with a scope of view limited to their county only. All four of them had good working relationships that in all probability extended beyond the confinement of police work. Sergeant Robert Flindall and Constable Jennifer Payne were very close friends. Sergeant Robert Flindall and Constable Richard Nie were next-door neighbours. Sergeant Flindall’s father (Inspector Bill Flindall) used to be a Peterborough County OPP Detachment Commander. Constable Shaun Filman’s father (Constable Brad Filman) used to be a senior Constable at the Peterborough County OPP Detachment. Moreover, Sergeant Robert Flindall’s wife, Constable Tanya Flindall, was a Constable with the City of Kawartha Lakes Detachment, which is a neighbouring detachment, and later on transferred to Peterborough Detachment. Constable Tanya Flindall is a sister of Sergeant Trevor Banbury who in turn was a shift supervisor at Peterborough Detachment. Thus, Sergeant Robert Flindall and Sergeant Trevor Banbury (badge 10270) are brothers-in-law (and good friends too). Moreover, Sergeant Trevor Banbury’s father was a Sergeant at Peterborough Detachment. Constable Jennifer Payne and Constable Jamie Brockley (badge 10489) were common-law spouses at the time and are now married. Constable Mike Gravelle (badge 11788) and Constable Marc Gravelle (badge 12091) were brothers at the Detachment. Constable Jeff Knier (badge 11703) and Constable Amanda Knier (badge 12695) were husband and wife at the detachment. In short, without naming anymore names at this point, there were many more officers at Peterborough Detachment who are originally from Peterborough County, residents of the county and are probably related in some way. In short, local mafia. The police officers who targeted me are all local to Peterborough. So much for the Ontario Public Service and the policies of the Ontario Provincial Police with respect to valuing diversity, treating everyone with dignity and putting public interests above private interests. Something terrible happens when poorly educated and narrow minded people put the uniform on and are given power over others. They become Nazis. It is a universal truth and a historic fact. Given my status as a foreign-born individual I had to work very hard for many years to earn the job of a police officer in Canada. Compared to me, my personal respondents got their jobs as police officers very easily. They stole my job from me. They caused significant mental damage to me. They maligned my reputation. They virtually stole my life. Had the OPP not offered me employment I could have been and most probably would have been hired either by the York Regional Police service or Halton Regional Police service where I would have certainly put my multicultural and linguistic skills to use since both of the services invited me for an interview and from what I know they do value officers with multicultural backgrounds. Even if the OPP had not hired me, I could have been working elsewhere and living a normal life. Unfortunately, the OPP hired me first and totally ruined me as after the termination of my employment with the OPP, no organization, let alone police services, wanted to have me on board. The OPP literally turned me into an “Undesirable” (OPP’s term). Even Brinks would not get back to me. If other officers that came along with me were not subjected to similar treatment that I was, can I be mistaken or faulted for having the perception that I, a highly-educated and hard-working minority and a member of a marginalized group, have been singled out and harshly targeted by some officers at the Peterborough Detachment? Please take a minute to visit the OPP’s website and OPP’s website page. Do you see the cultural and racial diversity of police officers the OPP so much prides itself on having? Alas, the reality appears to be different. I was not given a chance to perform my duties in a safe, harassment-free work environment. Despite the OPP’s claims to promote and accept diversity in the workplace, due to my cultural heritage and unique personality I was singled out as an outsider by both my commanders and platoon members leading to harassment and racism in the workplace. Differences in my accent and manner of speech were used against me as a communication problem. I have never had any problems in any of my previous places of employment or school. However, if they considered it inferior on any level, I was not provided with any communication training if this was the case. Also, at various times I found that my confidential discussions were leaked back to those harassing me. It was clear as they were all interconnected. I also encourage you to familiarize yourself with the Stanford Prison Experiment and see for yourself how normal people’s psychology and behavior can be altered in a very negative way in a matter of only a few short days. I, on the other hand, had to live and work for a period of almost a year in a workplace environment where I was discriminated against, harassed, bullied, humiliated, belittled, subjected to unreasonable demands and unsubstantiated criticism, being made to feel like a marionette and oppressed and retaliated against for standing up for my rights. No wonder at one point I asked Cst. Nie for permission to go to the washroom. For me, just knowing that justice will be done, is paramount for my dignity. I believe the only way I can ever know why this happened is to have all the truth come out in a public inquiry. I want to bring my private misfortune into the public realm for personal, legal and political resolution. I am convinced that if I am successful in my legal action then my ordeal and my struggle might reduce the possibility of somebody else having to go through what I did. My priority right now is to get to the bottom of the case and make sure this does not happen to any other minority within the OPP in the future. Hence, not only have I been fighting for my rights, but I have also been fighting for those who have been defamed, targeted, bullied and discriminated against, but never got justice. I was forced to resign from the OPP on December 15, 2009. From January 2010, Constable Lloyd Tapp and I worked on the preparing a strong case and filed an Application before the Human Rights Tribunal of Ontario (Tribunal) on December 13, 2010. I spent the last bit of my savings in a $2,500.00 retainer fee and secured the services of a reputable law firm Feltmate Delibato Heagle that felt the appropriate place to adjudicate his case was before the Tribunal. Since the filing of my Application my counsel removed herself from the case for personal reasons. I simply could not afford the legal fees and I was just thankful that a reputable firm had initiated justice for me. It is really sad that only the financially independent can afford such services. The average citizen has to resort to struggling to prosecute such cases to the best of their limited abilities. I then sought assistance from Mr. Tapp and he volunteered to represent me before the Tribunal. The hearing of my case commenced on May 22nd, 2012, and continued until the 24th. The matter was being heard by Vice Chair Keith Brennenstuhl of the Human Rights Tribunal of Ontario situated on the 14th Floor at 655 Bay Street, Toronto, ON M7A 2A3. The hearing continued on November 1st, 2012, and ran until November 7th, 2012. It was not until Day 4 of the hearing (November 1, 2012), that began with the Vice Chair’s strong recommendation for mediation, that Mr. Tapp and I realized that the Tribunal was limited in scope as to what it is allowed to do and that a Claim should have been initiated via the Superior Court of Justice. As the Vice Chair explained the Application could be frozen pending the outcome of the Claim. It was at this time that Mr. Tapp and I explained to Mr. Brennenstuhl that we believed all along, that being that a reputable law firm decided that the Tribunal was the appropriate place to proceed with the Application, we would have to finish there before commencing with a Claim. Needless to say, when mediation failed that morning the hearing continued and that very day Mr. Tapp started drafting up my Claim to be filed with the Superior Court of Justice. Mr. Tapp used the one hour lunch break to start working on the Claim. The hearing continued as scheduled until November 7, 2012, and then was adjourned until another block of five days could be determined by the Tribunal. In the meantime the hearing and the start of the cross examination strengthened me to the point that I was then committed to seeing my Claim pursue a course of justice via the Superior Courts. To that end, Mr. Tapp drafted a request for an order to have the hearing deferred and served it on the Tribunal and the OPP. Where my Ontario Human Rights Tribunal Application dealt with the OPP’s non-compliance with the Human Rights Code, my Claim dealt with Defamation by Slander and Libel that laid the foundation from which the OPP so casually and confidently violated my rights with respect to the Ontario Human Rights Code and played a role in laying a foundation of contempt towards me at the Peterborough Detachment of the OPP. This contempt turned into a lack of respect and utter disdain towards me from many of the personnel at the detachment. The continued defamation then fostered hatred towards me to the point that I was viewed as an undesirable and even formally accused of associating with undesirables. This very act is something that I will never forgive the OPP for. And yes, as astounding as it may sound, the OPP actually refers to Canadians who happen to have criminal records or have had criminal involvement as Undesirables. And so I sought justice via the Superior Courts of Justice in Toronto. My aim was to see my Claim proceed through to the very end of a trial so as to hold the OPP accountable for their actions and bring about an appropriate remedy. I wanted to bring transparency to the OPP and show the public the truth rather than the lies the OPP professes in their mission statements and core values. I had nothing to lose other than, as William Shakespeare wrote ‘A pound of flesh'. Unfortunately, and like many others, I was disappointed to experience the reality of justice in Canada. Many Canadians have observed that the Superior Courts only cater to the financially independent. If one cannot afford a lawyer they are barred by the Rules of Civil Procedure, the Courts of Justice Act and the Law Society of Upper Canada from having a friend who may possess a little more knowledge for representing them or even assisting them. What they are left with is having to face, in many instances, formidable giants who have an unlimited supply of finances at their disposal and try their best with their limited knowledge to prosecute their action. Such was my case. My claim was dismissed on April 2, 2014, by Justice Kevin W. Whitaker due to the Statue of Limitations and due to the Collective Agreement between the OPPA and the OPP. Though the collective agreement states in article 4.01(c) that a probationary constable cannot grieve their dismissal or termination of employment, counsel for the OPPA and the OPP argued that I was not dismissed or terminated but resigned. And that despite the indisputable and irrefutable evidence presented to the courts that Mr. Justice Whitaker obviously did not even bother to look at. What a farce! Mr. Tapp and I did our best by explaining that the resignation was not something that I drafted and handed in but it was a preprinted letter by the OPP that was presented to me with two options – sign this letter of resignation or be fired right away. Simply put, I was coerced into signing a resignation letter while two Ontario Provincial Police Association representatives, Karen German and Marty McNamara sat behind me quietly and did not intervene at all. To this end I have come to realize that the courts in Ontario are no place for the truth. They cater "justice" to those who have superior power and/or access to superior resources. Though the OPP put me on my knees once they will not do so again. After an unsuccessful attempt to seek justice via the courts my deferred application before the HRTO has been reactivated. During the course of the two hearing days on September 21 and 22, 2015, I was cross-examined by the counsel for the respondent, William J. Manuel, after which he attempted to dismiss my application based on no-reasonable prospect of success. However, my application was not dismissed and the hearing of my case before the HRTO has continued between February 8 and February 12, 2016, at 655 Bay Street, 14th Floor, Toronto, Ontario. During the course of those five hearing days a total of 13 witnesses were examined-in-chief by my friend Lloyd Tapp and personally by me when Lloyd fell very sick and could not attend the hearing for two consecutive days. The witnesses testified in the following order, Sergeant Brad Rathbun, Constable Marc Gravelle, Constable Kevin Duignan, Inspector (retired) Mike Johnston, Constable Mary D'Amico, Constable Melynda Moran, Sergeant Jason Postma, Mr. Marc Greco, Constable Jamie Brockey, Constable Karen German, Staff Sergeant Colleen Kohen, Chief Superintendent (retired) Mike Armstrong, Superintendent Hugh Stevenson. On February 11, 2016, a group of approximately 20-25 paralegal students, along with their instructors, attended the hearing. They had learned that my case was the longest running case before the HRTO so their instructors brought them to observe the proceedings. Needless to say, their attendance was very inspiring and encouraging. The hearing of my case before the HRTO has been scheduled to continue between September 7 and September 16, 2016, at 655 Bay Street, 14th Floor, Toronto, Ontario, starting at 09:30 am, during which time six more witnesses are expected to be called to testify, namely Staff Sergeant (retired) Ron Campbell, Sergeant (retired) Peter Butorac, Constable Shaun Filman, Constable Jennifer Payne, Sergeant Robert Flindall and Constable Richard Nie, in whatever order the respondent's new counsel will call them. The respondent has yet again changed their legal counsel. Mr. William J. Manuel was replaced by Mimi N. Singh. While it is hard to believe it remains a fact that the respondent has had six experienced legal counsels working on this case to date, namely Marnie Corbold, Lynette D'Souza, Lorenzo Policelli, Heidi Blutstein, Bill Manuel and Mimi N. Singh, all of whom are on the Ontario Sunshine list, against two ordinary citizens with no legal experience whatsoever - a poor immigrant and a poor unemployed police officer. Isn't that sad? I want to thank all the people who have been supporting me through this process. It is amazing how many ordinary people provided me with their support. I have gotten numerous correspondences from people saying that I am a true man, that I am making them proud for trying to hold accountable the thugs in uniform, that the OPP is corrupt, that there are many dirty cops in the Peterborough OPP Detachment and that the detachment is inherently corrupt, that it was a gift to my soul not to become a permanent member of the OPP, etc. In short, I got a lot of support and encouragement and very few denunciations from members of the public who the OPP professes to serve. Thank you to all the people who have been supporting me!